Sending 100th birthday wishes as great as the special centenarian in your life happens every day. Queens do it. Presidents do it. So do Prime Ministers. You can too…with the amazingly original birthday messages for 100 year olds on this page. The 100th birthday of someone special is, beyond doubt, a major milestone that calls for a milestone celebration. 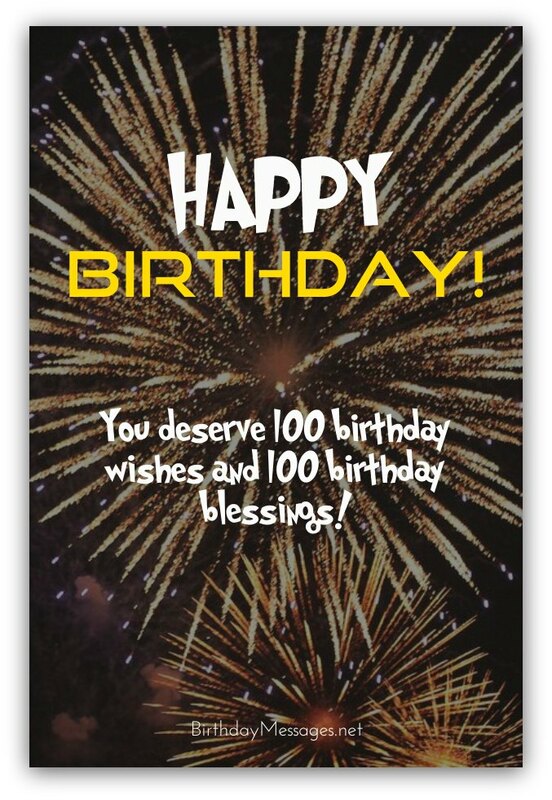 Whether you choose to throw a low-key or gigantic party in honor of your 100th birthday girl or boy, you'll need a beautifully written 100th birthday greeting that's as unique as a 100th birthday! 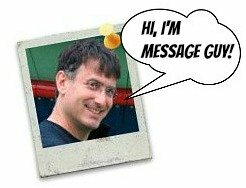 If you need me to help you pick the best 100th birthday message on this page (or the next), take a moment right now to check out the helpful hints Message Guy Tip #29 has to offer. If we lit a birthday candle for every life you've enhanced, your birthday cake would light up the entire sky. Happy 100th birthday! Bravo! Your 100th birthday is cause for a great celebration. It’s quite an achievement. Happy 100th birthday! Wishing you a special day that honors your 100th birthday and everything you've done to make the world a better place the last century. A standing ovation wouldn't come even close to what you deserve from everyone blessed to know you. You deserve 100 standing ovations — one for every year you've brought countless moments of love, joy, support, compassion and wonder to so many lives. Let me be the first of many to applaud you. Happy 100th birthday! Happy 100th birthday! When your birthday cake comes out, lit up by 100 burning candles, we will not only be celebrating your 10 decades on this planet — we'll be basking in the light you so generously and lovingly bestow upon us all. Keep your chin up — if you can still manage it. Besides, you're only one-tenth of the way to 1,000 years old. Hoping your 100th birthday is unforgettable for you. It is certainly for us, because you're unforgettable. Happy birthday! You are very special and surely honor is due for all the great things that you've done in your life. Happy 100th birthday! Happy 100th birthday – today is a special birthday bash for a special person on a special occasion! Your 100th birthday means 100 candles on your birthday cake. Don't worry, we'll be there to help you blow them all out. After all, you've always been there for us. Happy birthday! You deserve 100 birthday wishes and 100 birthday blessings! Happy 100th birthday! Your life has inspired so many. Everything about you will resonate in everything we do for many years to come. Happy 100th birthday! There's more to check out! You are very special! You've done more in your lifetime than anyone we know. You truly are the most amazing 100 year old anywhere! Happy 100th birthday! May every moment of your 100th birthday be filled with joy and health. Here’s to a healthy and peaceful life for years to come. Happy 100th birthday! Warm wishes on your 100th birthday. May your birthday bring you more happiness and love. You deserve it. Happy 100th birthday! Wishing you the health and joy you deserve! Congratulations on reaching a century in age. WOW! Happy 100th birthday! Each new day holds the promise of happiness and peace of mind. It’s another opportunity to embark on a new journey, another day to celebrate life. Today, we're celebrating your 100 years of life. You've always been an inspiration to everyone your entire lifetime. Happy 100th birthday!